SimCity is an open ended city building video game series where the player (acting as mayor) is given the task of founding and developing a city, while maintaining the happiness of the citizens and keeping a stable budget. 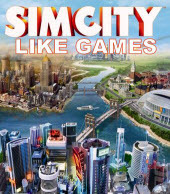 If you are a fan of City building games like SimCity and looking for more games like SimCity then find the recommendations for it below which offers familiar gameplay Don't forget to mention if we miss any games that are similar to SimCity as we keep on updating this list. Cities XL is a city-building computer game developed by Monte Cristo. The game allowed players to play online and interact with others on massive persistent planets, and to work together by trading resources or building blueprints in order to satisfy the needs of city inhabitants. Tropico 4 is a construction and management simulation video game developed by Haemimont Games and published by Kalypso Media. The game centers on a main character by the title of "El Presidente" - the dictator that runs the island banana republic. The game consists two extensive campaigns consisting of more than 30 unique missions including the new Modern Times campaign. Anno 2070 is a city-building game and economic simulation game, with real-time strategy elements. In 2070 due to global warming the rised ocean levels and climate change has made large stretches of land inhospitable. Your job is to build your society of the future, colonize islands, and create sprawling megacities with multitudes of buildings, vehicles, and resources to manage. Tycoon City: New York is a city-building game where players are tasked with developing New York City(specifically the island of Manhattan). The game offers two modes a campaign mode where the players has to build New York district by district, starting with Greenwich Village and Sandbox mode which is a free building form of the game where the players have control over the entire island. Children of the Nile is a city-building game set in ancient Egypt, developed by Tilted Mill Entertainment. The game has hundreds of citizens, each with their own individual free will and lives, which affect your city-building decisions and your ability to build and rule an empire. Cities in Motion,....if you can think of more, then don't forget to mention it in comments.